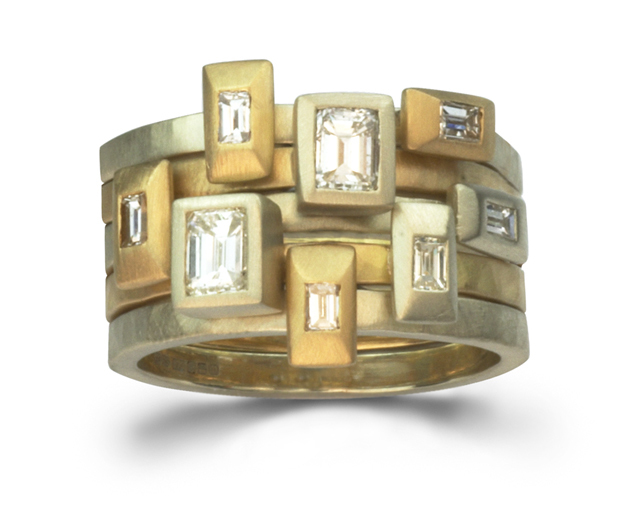 This ring was made in 9ct white and yellow gold with a matt finish but it can be designed in any metal with any stones. Prices start at 0.8cts £3000 using all small diamonds and 9ct gold or less using semi precious stones. The ring pictured has two half carat emerald cut diamonds and six baguette cut diamonds of between 0.05 and 0.1 cts. The total carat weight is 1.5cts and would cost £5600.